I have for sale a one owner from new Fairey Marine Duckling. She is in good used condition and the old boy that owned her from new has looked after her well, she is original and has had no new wood fitted to her. She is so original that all the ropes are the same from new, she also has the original mast bag from new all be it in a poor condition. 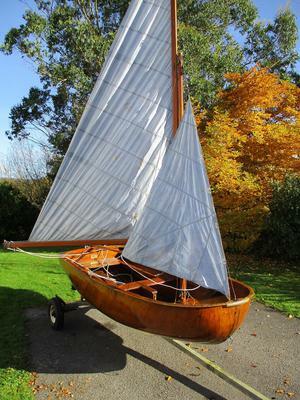 She comes with original light blue sails, mast, boom, rudder, centre board and centre board blanking plate (for when using a motor or oars), oars and period air bags which still hold air. The only non original bit is the road trailer she sits on.